I looked across the street and remembered how a few people have told me to check out Stella's Italian Restaurant and for some reason, I have never been there. The exterior never attracted me. Stella's was also very crowded, but they found room for us at a tiny table in the back. It was a tight squeeze, but romantic. The ambiance is very warm and friendly, and it kind of reminded me of an Italian restaurant we used to go to in Brooklyn when we were dating. Adam our server had a great sense of humor, and was over-the-top friendly and helpful. I started with a stuffed artichoke, which was soaked with buttery bread crumbs. Tom really enjoyed the antipasto plate with meat. I tried the cheese on the plate, which was divine! Our entrees came with a family style salad—very fresh romaine lettuce tossed with oil, vinegar, and Gorgonzola cheese. I'm not a blue cheese lover, but I still loved the salad. 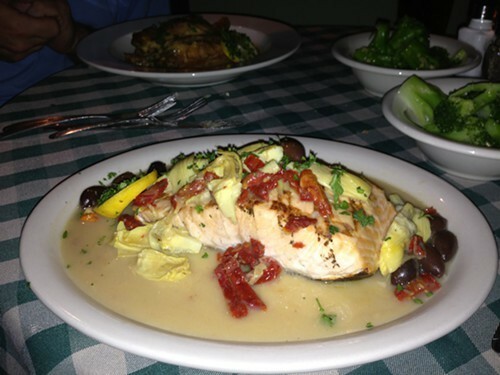 For our entrees, Tom had the chicken francese, and I had the grilled salmon. I couldn't believe the size of the salmon. (This was the first time I ever had to take a salmon dish home with me because I couldn't finish it.) For dessert we shared a yummy flour-less chocolate cake. The cappuccino was so good I forgot to take a photo of it. I would definitely recommend Stella's if you are looking for a really good Italian restaurant in the Hudson Valley to go to with friends or family. 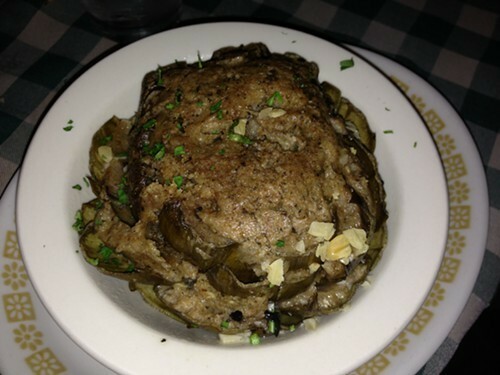 A few readers have raved about the stuffed green peppers and the lasagna at Stella's too. I can't wait to go back and try a pasta dish. For more Hudson Valley Good Stuff recommendations, visit Vanessa Ahern's Hudson Valley Good Stuff blog, and sign up for her newsletter.